Hello there, and welcome back to the Furever Bookkeeping blog. As Baltimore’s accounting and bookkeeping experts, we understand that for many business owners, it can be tricky to determine when to hire a professional accountant. Most business owners prefer to have a role in every aspect of their business to ensure that things are getting done effectively and efficiently to improve the success of their business. Managing company books and finances, however, takes a great deal of time, and understanding the ins and outs of taxes can be a complicated task. For business owners, those who are self-employed such as contractors, freelancers, and so on, every penny counts, as does every minute. Therefore, using an external bookkeeper to clean up and manage a business’s books has many great advantages that can save business owners time and money. Please continue reading below to learn more about these great benefits in part one of this short blog series. A certified bookkeeper is dedicated to maintaining a business’s books on a daily basis—it’s what we’re trained to do. Professional bookkeepers have had the necessary education and experience that is required to fully understand and manage the financial aspects of a business. What’s more, it can be presumed that most professional accountants really like what they do, and enjoy helping people sort out their books to improve the health of their business, and help their company grow. Additionally, and perhaps most importantly, accounting experts have a strong knowledge and keen understanding of the tax system. It’s not to say that business owners are incapable of managing their own books, but most business owners simply don’t have the proper training required to do their own accounting correctly. 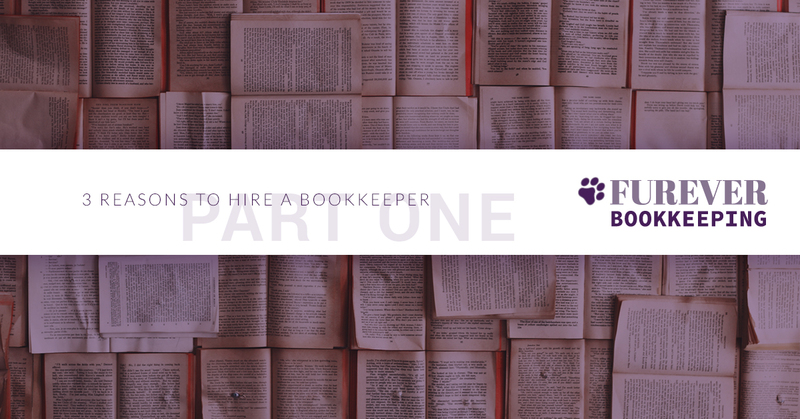 By combining our training, experience, and drive, experienced bookkeepers like ourselves can make sure a business’s books are organized, healthy, and accurate so that company can continue to grow and thrive. An experienced bookkeeper can stamp out inefficiencies in finance and accounting. Keeping inaccurate financial records, whether unintentionally or deliberately, is one of the leading causes of small business failures. Having an efficient bookkeeping management system in place can ensure that books are being managed correctly, which will maximize cash flow. Because every penny counts, business owners want to track all business expenses. Excellent bookkeepers should be certified in up-to-date accounting software programs which enhance their knowledge-base and skill sets. Most small business owners simply don’t have the time to spend learning accounting programs that can be quite confusing without any accounting education or experience in bookkeeping. By combining knowledge, experience, and dedication with the latest bookkeeping software, we as professional bookkeepers have the necessary skill set to efficiently and accurately track and manage your business’s financial records. A certified bookkeeper should be able to provide the business owner with a precise portrayal of all expenditures, sales, and purchases, while keeping track of receipts, payments, and any other financial records that contribute to the business’s accounting. Doing this allows us to make sure that every cost is accounted for and entered correctly to help maintain the vitality of your business. View our bookkeeping FAQs page to learn more about how bookkeeping inefficiencies can harm your business. For many small business owners, hiring a certified bookkeeper can seem like an additional expense. As mentioned above, most owners prefer having a hand in all aspects of their business, which for many is unavoidable if they have little or no employees to help with running the business. The truth is, business owners actually spend more money than they save when they attempt to manage their financial records on their own. A bookkeeper has the knowledge, training, and commitment to detail, each of which is necessary when tackling a business’s books quickly, yet efficiently. For instance, if a business owner attempts to run a financial analysis or reconcile a bank account, these tasks can take them hours or even days to do. In most cases, they simply don’t have the extra time to spare to run these checks and balances efficiently or correctly, whereas a certified bookkeeper who performs these accounting tasks day in and day out can complete them in a short amount of time, in the most economical manner. To be frank, it’s best to leave the bookkeeping and accounting to the experts. These are just a few of the benefits business owners gain from outsourcing their accounting, yet there are many more advantages to discuss. Please join us next time to hear more of the wonderful benefits of hiring a professional bookkeeper. Here at Furever Bookkeeping in Baltimore, our team is fully dedicated to using our skills and experience for cleaning up your books while helping you manage the financial aspects of your business. Please give us a call or visit our site today. We’re happy to answer any questions you may have and would love to help get your books in order. We look forward to working with you!